Download "A step by step guide. Contracting through your own limited company." 1 A step by step guide. Contracting through your own limited company. 3 Responsibilities Setting up and operating a limited company is a major commitment. You will be responsible for making sure each and every step of the process is managed and completed correctly. There are strict legislative deadlines and harsh penalties if these are missed. Luckily, Simplyco is on hand to help you to meet all of your obligations. We re all about making your life less complicated. Who are we? 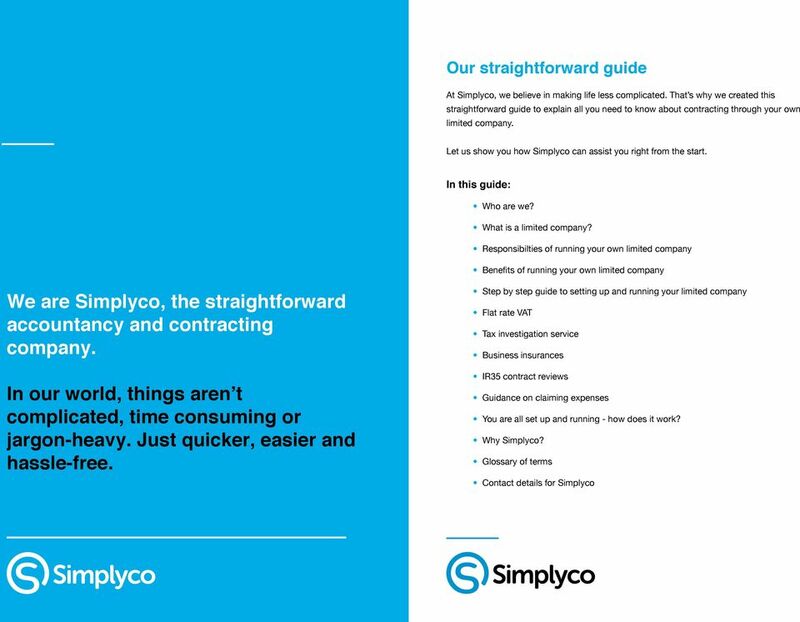 We are Simplyco, the straightforward accountancy and contracting company. In our world, things aren t complicated, time consuming or jargon-heavy. Just quicker, easier and hassle-free. As a director, you are responsible for ensuring that the company is run in accordance with The Companies Act According to this act, all Private Limited Companies must have at least one director. Typically, that will be you. You need to ensure that your limited company: Complies with company law What is a limited company? A limited company is a legal entity in its own right. In other words - it has its own legal rights and obligations. The company is owned by its shareholders and run by its directors. If you are opening your own limited company, you are both a director and a shareholder. Produces accounts properly Makes all statutory returns Is adequately insured Meets all health and safety obligations Limited companies must be registered at Companies House. 4 Benefits Running a limited company carries a lot of responsibilities. It brings a greater administrative burden than other business models. However, there are several advantages that include: Limited liability If you run a limited company you are protected if things go Sally. Resources Management Pete. Web Designer Ian. Change Management wrong. As long as you have followed the rules, as a director you will not be personally liable for any financial losses made by the company. A sole trader would not be protected in this way. If anything went wrong they would be liable for all financial losses within the business. Tax This is one of the main benefits of working via a private limited company. As a director and shareholder you can choose your own remuneration package. Separate entity A limited company is a legal entity in its own right. Everything from the company bank account to the ownership of assets belongs to the business. They are totally separate from the interests of the directors and shareholders. In contrast, a sole trader and their business are treated as a single entity for tax and administrative purposes. This enables you to manage your own personal tax liability and potentially save on Income Tax and National Insurance. Perception If you tender for business with larger companies, it can help if you are working via a limited company. This is because it gives a more professional image. Some industries will only deal with limited companies. Protection Once you have successfully registered your company, your company name is protected by law. Companies House has very strict rules for the naming of companies so no one else can use your name or anything deemed too similar. Ownership Your company may have a sell on value when you decide to retire. Depending on your situation, you may wish to sell the company or bring a new director on board when you wish to take a less active role in the business. 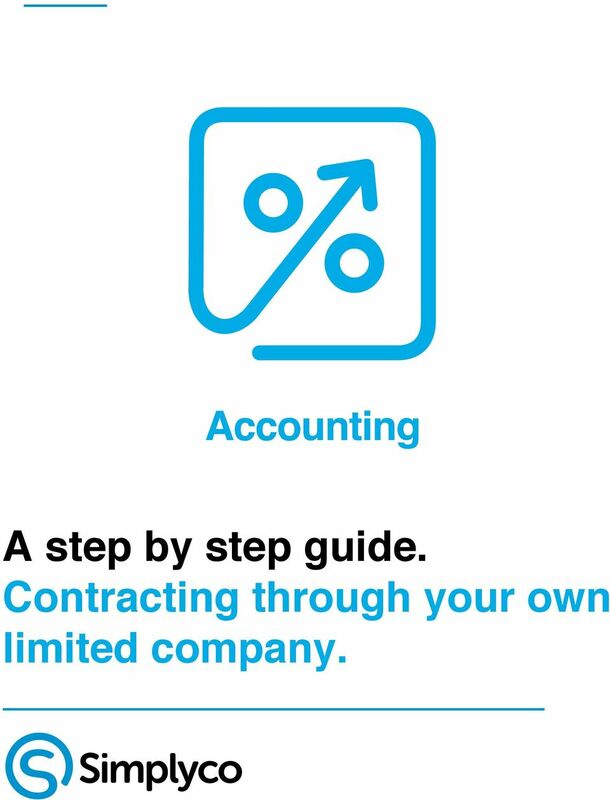 5 Setting up and contracting Step 1 - Setting up your own limited company Simplyco can incorporate a limited company on your behalf. Let us know what you would like your company to be called and we will do the rest. The company name can t contain certain words or expressions but these are all listed by Companies House. We will charge you just 50 plus VAT to incorporate your company. Or you can opt for our same day service which is 65 plus VAT. Step 2 - Your company will need its own bank account The next stage is to make an appointment with your bank to set up a business bank account. Remember that your company is a separate entity and will require its own banking facilities. You will need to take your Certificate of Incorporation and Memorandum of Association and Articles of Association. Simplyco will provide you with these documents once the company is set up. 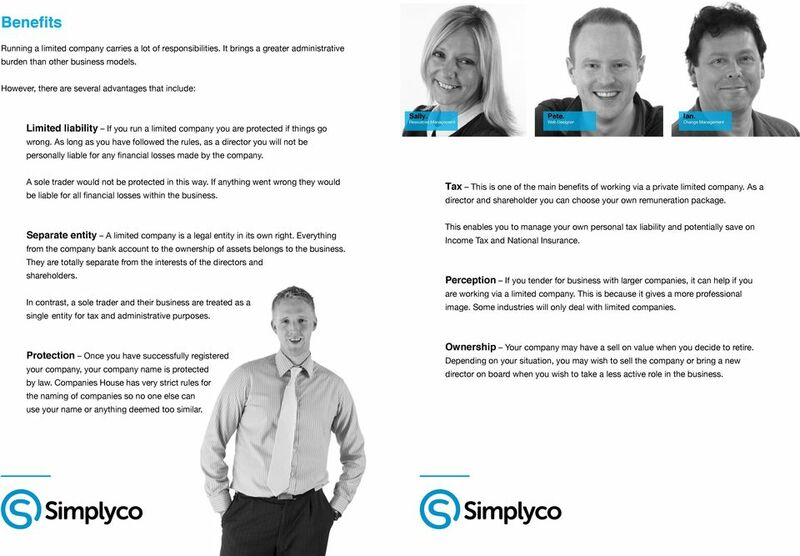 Step 3 - Appoint Simplyco as your accountant Our business is all about helping you runs yours efficiently and legally. We make running your own limited company as straightforward as possible, freeing you up to do what you do best. There are many obligations placed on a limited company and we are here to help. 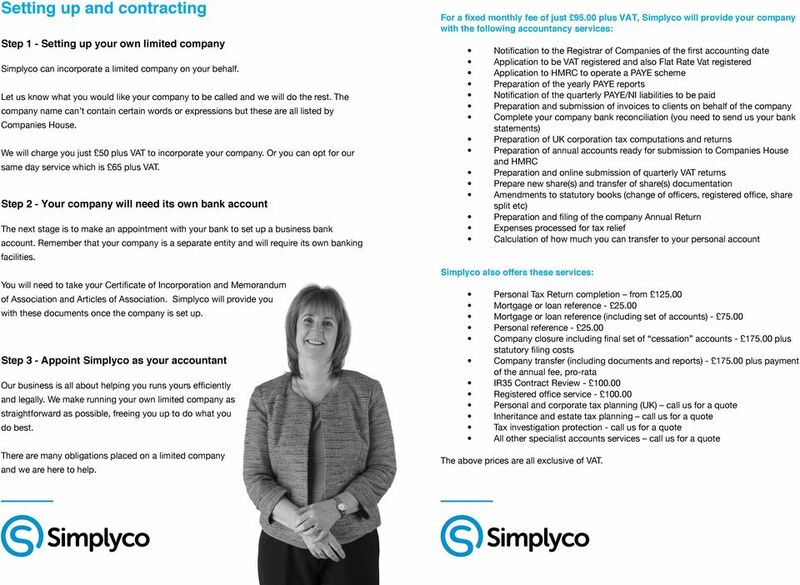 For a fixed monthly fee of just plus VAT, Simplyco will provide your company with the following accountancy services: Notification to the Registrar of Companies of the first accounting date Application to be VAT registered and also Flat Rate Vat registered Application to HMRC to operate a PAYE scheme Preparation of the yearly PAYE reports Notification of the quarterly PAYE/NI liabilities to be paid Preparation and submission of invoices to clients on behalf of the company Complete your company bank reconciliation (you need to send us your bank statements) Preparation of UK corporation tax computations and returns Preparation of annual accounts ready for submission to Companies House and HMRC Preparation and online submission of quarterly VAT returns Prepare new share(s) and transfer of share(s) documentation Amendments to statutory books (change of officers, registered office, share split etc) Preparation and filing of the company Annual Return Expenses processed for tax relief Calculation of how much you can transfer to your personal account Simplyco also offers these services: Personal Tax Return completion from Mortgage or loan reference Mortgage or loan reference (including set of accounts) Personal reference Company closure including final set of cessation accounts plus statutory filing costs Company transfer (including documents and reports) plus payment of the annual fee, pro-rata IR35 Contract Review Registered office service Personal and corporate tax planning (UK) call us for a quote Inheritance and estate tax planning call us for a quote Tax investigation protection - call us for a quote All other specialist accounts services call us for a quote The above prices are all exclusive of VAT. 6 Flat rate VAT The Flat Rate VAT Scheme is an incentive provided by the government to help simplify taxes. It means you charge VAT on your invoices at 20%. But, you pay VAT to HMRC at a lower rate. Rates vary depending on your profession, but are typically between 10 and 14.5%. For the first year you will also save an additional 1%. Lizzie. Designer Chandra. Process Engineer Alex. Testing Engineer In short, the company collects 20% in VAT but pays over a smaller percentage to HMRC. The result - you benefit from some additional income. Tax investigation protection A worthwhile optional extra. Our tax investigation service is fully backed by an insurance policy. 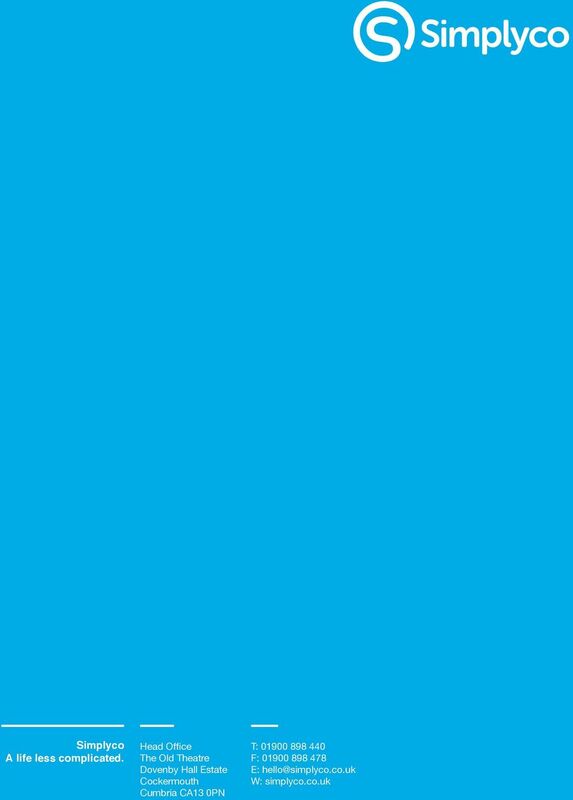 This service covers many types of tax enquiries and you are able to make a claim in respect of our fees in defending you if you are investigated by HM Revenue & Customs. This product ensures you will not incur any additional fees from us if you are selected for an enquiry. Another service to help give you complete peace of mind. IR35 contract reviews IR35 (or the Intermediaries legislation) was first introduced in April It has become an important factor in determining the status of freelancers and the way income is treated for tax purposes. The contractual terms of engagement are the most important element when determining status. Therefore, contractors must ensure that they have the best possible terms in place and that they are a true reflection of working practices. When HMRC makes a contractor the subject of an IR35 enquiry, it is a major advantage if the contractor has already had their contract checked for IR35 compliancy. In the HMRC s eyes, this shows due diligence, and keeps any subsequent fines and penalties to a minimum. Business insurance Your company may need to hold Professional Indemnity Insurance as well as Public and Employers Liability Insurance. You might also want to consider other insurances such as Permanent Health Insurance, Accident and Sickness Insurance etc. Always check with the client (which could be an agency) what level of cover you will likely need. Simplyco has been trained by specialist tax company, Acumen Legal Services, to provide a comprehensive contract review. Our reviews give you a simple pass or fail and supplies full details of any changes you need to make. Acumen Legal Services are one of the country s leading IR35 specialists and are unrivalled in successfully defending IR35 cases an important resource to have at our finger tips. 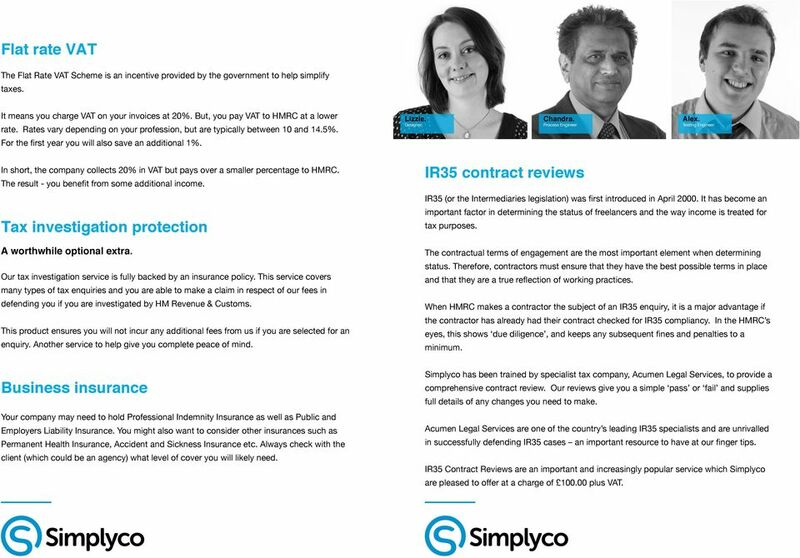 IR35 Contract Reviews are an important and increasingly popular service which Simplyco are pleased to offer at a charge of plus VAT. 7 Claiming expenses One of the advantages of operating as a limited company is the ability to claim tax relief on expenses. To qualify for this the expense needs to be wholly and exclusively incurred in the course of running your business. Certain restrictions apply to the claiming of tax-free expenses; the most well-known being the 24 month rule. 24 month rule If you work in the same place for 24 months or more, or expect to remain at that same site for 24 months or more, any expenses claimed in relation to this site will no longer be allowable for tax purposes. Company vehicles It is possible to claim tax relief on a vehicle owned by the company. The overall benefit of doing this is heavily dependant upon the type of vehicle and the element of personal use. Generally it is not advisable to buy a car through your limited company as the disadvantages often outweigh the benefits. Commercial vehicles however (vans and certain types of pick up), have reduced personal liabilities and still may be of benefit. Each situation must be judged on its own merits and our accounts team are always on hand to help you find the most tax efficient way to claim your travelling expenses. Use of private vehicles Mileage can be claimed for travel to and from a temporary workplace. Maximum tax free rates apply depending on number of miles, type and size of vehicle. These rates are summarised in the table below: Type of Vehicle Up to 10,000 Miles Over 10,000 Miles Motorcar 45p per mile 25p per mile Motorbike 24p per mile 24p per mile Bicycle 20p per mile 20p per mile Other travel costs Rail and air travel costs can be recovered if necessarily incurred in the performance of work duties. The cost of the use of buses and taxis is also an allowable expense. Other allowable expenses include bridge, road and tunnel tolls, congestion and parking charges where the expense is solely related to business. Again, receipts are required. Note: Mileage is reset to zero at the beginning of each tax year. An additional 5p per mile can be claimed if you are carrying a passenger. No receipts are required in respect of mileage claims although evidence of the business journey itself must be kept. Only business related travel can be claimed, personal mileage claims are not allowable. 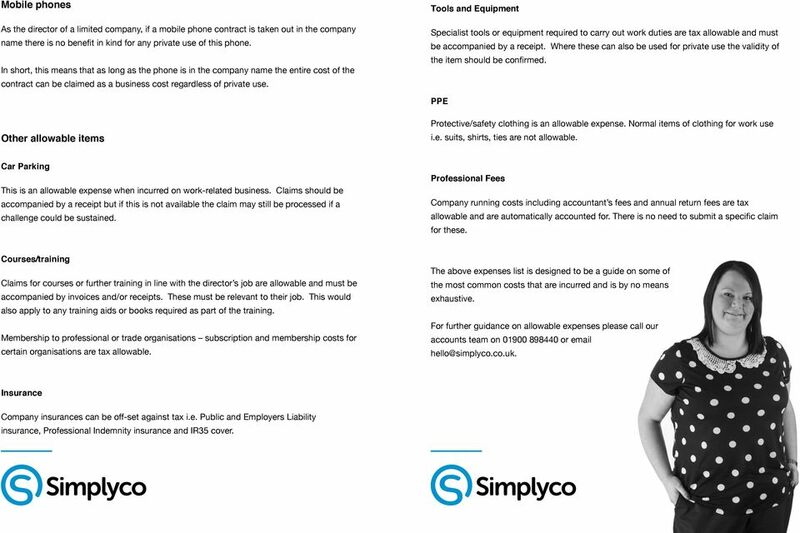 9 Mobile phones As the director of a limited company, if a mobile phone contract is taken out in the company name there is no benefit in kind for any private use of this phone. In short, this means that as long as the phone is in the company name the entire cost of the contract can be claimed as a business cost regardless of private use. Tools and Equipment Specialist tools or equipment required to carry out work duties are tax allowable and must be accompanied by a receipt. Where these can also be used for private use the validity of the item should be confirmed. PPE Other allowable items Protective/safety clothing is an allowable expense. Normal items of clothing for work use i.e. suits, shirts, ties are not allowable. Car Parking This is an allowable expense when incurred on work-related business. Claims should be accompanied by a receipt but if this is not available the claim may still be processed if a challenge could be sustained. Professional Fees Company running costs including accountant s fees and annual return fees are tax allowable and are automatically accounted for. There is no need to submit a specific claim for these. Courses/training Claims for courses or further training in line with the director s job are allowable and must be accompanied by invoices and/or receipts. These must be relevant to their job. This would also apply to any training aids or books required as part of the training. Membership to professional or trade organisations subscription and membership costs for certain organisations are tax allowable. The above expenses list is designed to be a guide on some of the most common costs that are incurred and is by no means exhaustive. For further guidance on allowable expenses please call our accounts team on or Insurance Company insurances can be off-set against tax i.e. Public and Employers Liability insurance, Professional Indemnity insurance and IR35 cover. 10 You are set up and running - what now? 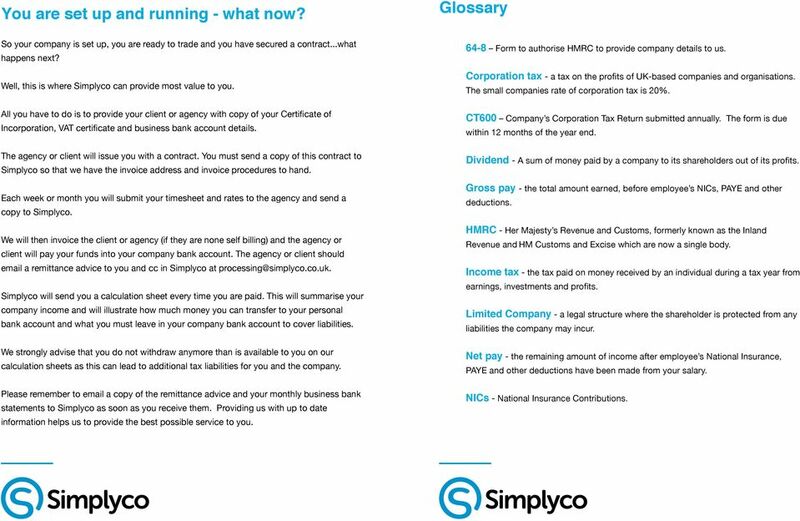 Glossary So your company is set up, you are ready to trade and you have secured a contract...what happens next? Well, this is where Simplyco can provide most value to you. All you have to do is to provide your client or agency with copy of your Certificate of Incorporation, VAT certificate and business bank account details. The agency or client will issue you with a contract. 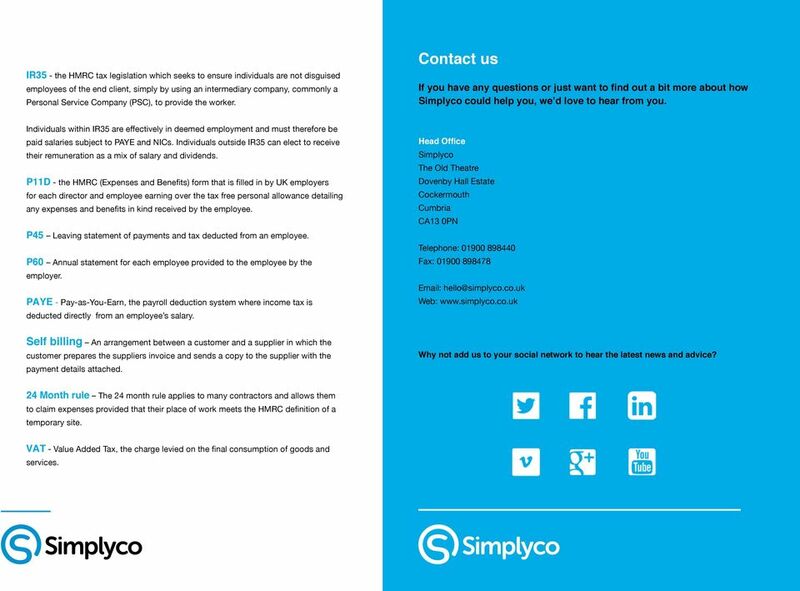 You must send a copy of this contract to Simplyco so that we have the invoice address and invoice procedures to hand. 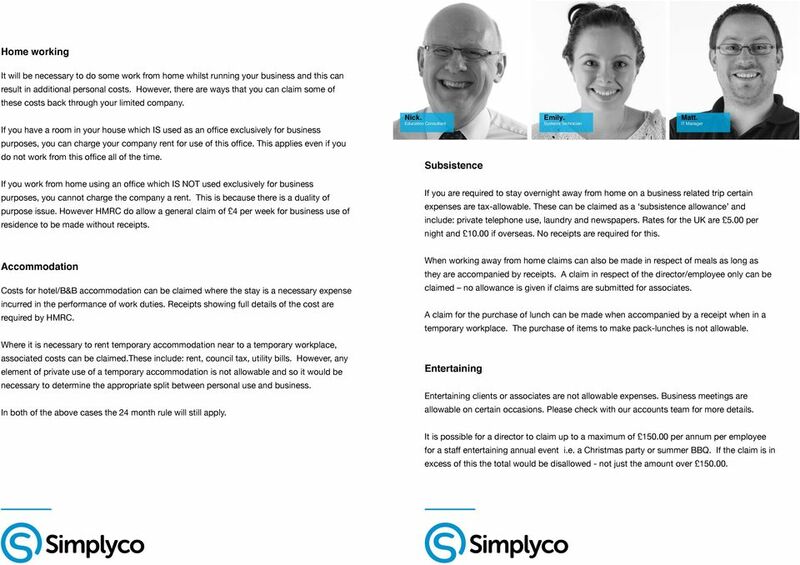 Each week or month you will submit your timesheet and rates to the agency and send a copy to Simplyco. We will then invoice the client or agency (if they are none self billing) and the agency or client will pay your funds into your company bank account. 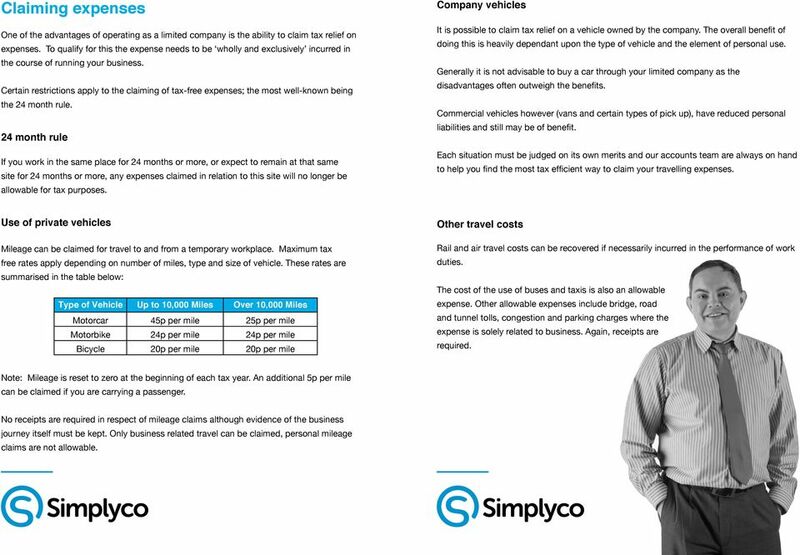 The agency or client should a remittance advice to you and cc in Simplyco at Simplyco will send you a calculation sheet every time you are paid. This will summarise your company income and will illustrate how much money you can transfer to your personal bank account and what you must leave in your company bank account to cover liabilities. We strongly advise that you do not withdraw anymore than is available to you on our calculation sheets as this can lead to additional tax liabilities for you and the company. Please remember to a copy of the remittance advice and your monthly business bank statements to Simplyco as soon as you receive them. Providing us with up to date information helps us to provide the best possible service to you Form to authorise HMRC to provide company details to us. Corporation tax - a tax on the profits of UK-based companies and organisations. The small companies rate of corporation tax is 20%. CT600 Company s Corporation Tax Return submitted annually. The form is due within 12 months of the year end. Dividend - A sum of money paid by a company to its shareholders out of its profits. Gross pay - the total amount earned, before employee s NICs, PAYE and other deductions. HMRC - Her Majesty s Revenue and Customs, formerly known as the Inland Revenue and HM Customs and Excise which are now a single body. Income tax - the tax paid on money received by an individual during a tax year from earnings, investments and profits. Limited Company - a legal structure where the shareholder is protected from any liabilities the company may incur. Net pay - the remaining amount of income after employee s National Insurance, PAYE and other deductions have been made from your salary. NICs - National Insurance Contributions. 11 IR35 - the HMRC tax legislation which seeks to ensure individuals are not disguised employees of the end client, simply by using an intermediary company, commonly a Personal Service Company (PSC), to provide the worker. 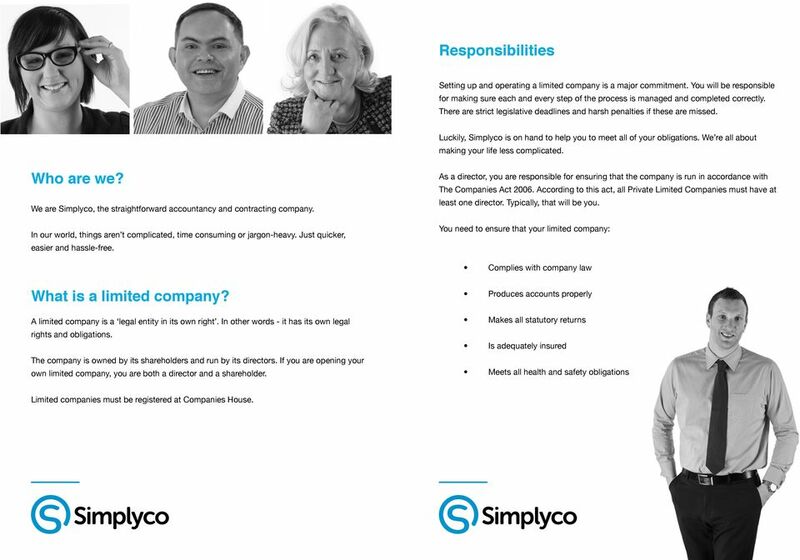 Contact us If you have any questions or just want to find out a bit more about how Simplyco could help you, we d love to hear from you. Individuals within IR35 are effectively in deemed employment and must therefore be paid salaries subject to PAYE and NICs. Individuals outside IR35 can elect to receive their remuneration as a mix of salary and dividends. P11D - the HMRC (Expenses and Benefits) form that is filled in by UK employers for each director and employee earning over the tax free personal allowance detailing any expenses and benefits in kind received by the employee. P45 Leaving statement of payments and tax deducted from an employee. P60 Annual statement for each employee provided to the employee by the employer. PAYE - Pay-as-You-Earn, the payroll deduction system where income tax is deducted directly from an employee s salary. Head Office Simplyco The Old Theatre Dovenby Hall Estate Cockermouth Cumbria CA13 0PN Telephone: Fax: Web: Self billing An arrangement between a customer and a supplier in which the customer prepares the suppliers invoice and sends a copy to the supplier with the payment details attached. Why not add us to your social network to hear the latest news and advice? 24 Month rule The 24 month rule applies to many contractors and allows them to claim expenses provided that their place of work meets the HMRC definition of a temporary site. VAT - Value Added Tax, the charge levied on the final consumption of goods and services. Whether you re a plumber, a mobile hairdresser or a physiotherapist you ll incur costs as a result of running your business.